Bridgman Bowling Club was conceived by the late Bert Bridgman in 1985. Mr Bridgman instigated the construction of a 4-rink outdoor bowling green on some vacant land on his Eagle Works factory site. The work started in 1985 and the green was ready and open for bowling in the1985/1986 season, at the cost of £11,314. As the end of the 1985/1986 outdoor summer season approached and the long cold winter loomed ahead, Bert Bridgman took his vision one stage further and prompted the construction of an indoor arena to facilitate year round bowling. Almost immediately, trees next to the outdoor green were felled and 18 inches of ground was removed as preparation for the building begun. The whole project was funded by Bert and apart from the construction of the large steel-joisted roof; the entire build was carried out by members of the club, local people, friends of Berts’ and Bridgman workers. The construction was completed in 1988, with the club boasting fully-functional outdoor and indoor facilities. 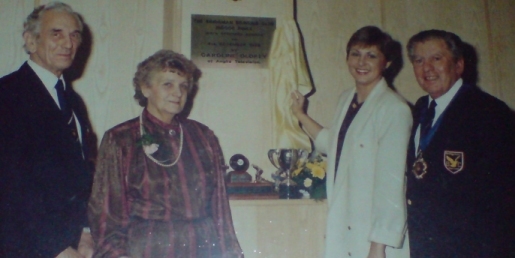 It was officially opened in December 1988 by Anglia regional newsreader, Caroline Oldrey, seen on the right of the photograph below with Bert Bridgman on her right. Bert Bridgman enjoyed the fruits of his labours and commitment to the Bridgman Bowling Club up until 1994 when he sadly passed away. However he had firmly established himself in North Bedfordshire folklore and had left a legacy on the club, the village and the wider community; never to be forgotten. In 1998 concerning news reached the club that Bridgman Doors Ltd (in receivership) was intending to sell the Eagle Works site, which included the Bowling Club, for property redevelopment. To this end, club members rallied together to save the threatened club. On the 10th of June 1998, a successful lottery grant application was submitted in order to pull together much needed money to purchase the freehold of the land occupied by the club. This grant and other pooled resources would secure the long-term future of the bowls club which was hanging in the balance at that moment in time. The purchase would include the outdoor green, clubhouse and the car park, and Bridgman Doors Ltd (in receivership) agreed to the proposal with the sum of £130,000 agreed for the outright purchase. Had the application for lottery funding failed, it would have spelled the end for this sporting facility. The indoor bowling club is one of only five in the Bedfordshire County and the only one serving North Bedfordshire. It would have been a devastating blow for many people, especially for those for whom the bowls club provided their only sporting and social outlet. Extensive work was undertaken by many different members to ensure that enough money was pulled together to buy the freehold and bring the club up to a required standard for it to thrive and become self-sufficient in the future. Land Purchase = £130,000 – Adaptation of Existing Buildings For Disabled Access – £19,462 – New Carpet/Level Boards = £17,566 – Connection To Electricity & Water Supplies = £10,539 – Heating System = £5,637 – Professional Fees = £2,648 – Burglar Alarm = £1,298. Today Bridgman Bowling Club is a well established friendly club with modern facilities and an extensive membership. Members from as far a field as Newport Pagnell travel to enjoy bowls at Bridgman Bowling Club and new members are always welcomed and embraced with open arms. By all accounts there has been an impressive transformation from a disused piece of factory land in 1985 to the striking and self-efficient club today.